The Harpy Eagle population of the world may be small, but it is renowned as the largest eagle/raptor in the entire world. A full grown female can weigh in anywhere from 8 kg to the astonishing 12 kilograms. This make the female Harpy Eagle the larger of the sexes. An average adult male weighs about 5 kilograms (Piper 2007). To go along with its mighty size, the wing span this eagle uses to fly with fast, precise movements can be up to two meters in length. This is an ideal length for an eagle that can stay in the air for long periods of time. 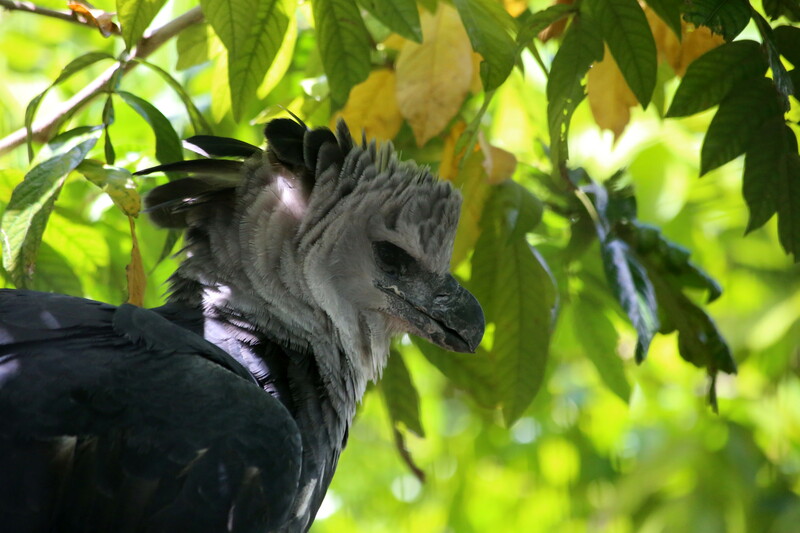 This type of Harpy Eagle usually lives in an open environment, while an eagle living in a forested have shorter, more complex wings for propulsion and maneuverability (Piper 2007). To pair with its amazing wings, the Harpy Eagle has the largest talons of any eagle in the world. They almost double the size of the second largest eagle in the world, the Golden Eagle. They use these talons to grab on to, and hold large prey such as sloths and small monkeys. They use their powerful wings to bring their prey up in the air with them, and they either kill their prey by dropping them from a high elevation, or use their giant, sharp beak to eat them dead or alive in their nest (Seymour 2010). These eagles are perfect predators for any environment that they currently reside in.